The Durham, NH Fire Department recently coordinated the purchase of 11 LifePak 500 Automated External Defibrillators for the University of New Hampshire. 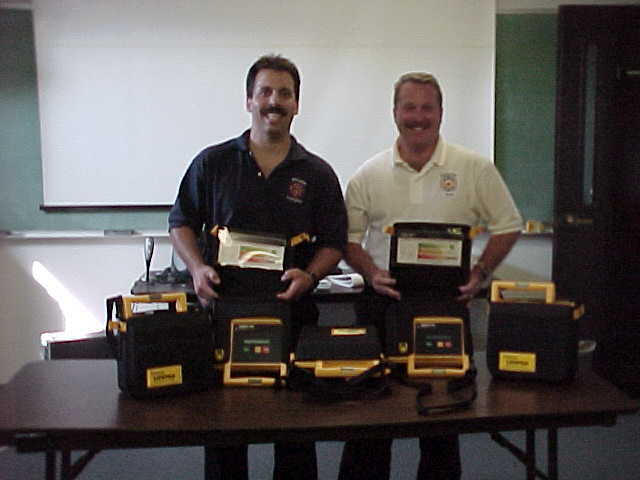 The initiative began when EMS Coordinator James Lapolla approached the department's administration and UNH to have one or two AEDs purchased and placed in central locations around campus. Thanks to the collective efforts of Lapolla, Fire Chief Ronald O'Keefe, along with UNH Vice President for Student Affairs Leila Moore and UNH President Joan Lietzel, the campus community will have the benefit of the expanded number of AEDs. The placement of AEDs in campus buildings is unprecedented according to research conducted by the fire department. UNH is believed to be the first university to place AEDs in buildings other than Campus Recreation buildings. The UNH defibrillators will be placed in the Whittemore Center, a 7,000 seat multi-use arena, Memorial Union Building which is a student center, The New England Center which is a restaurant and conference center, the UNH Athletic trainers, and the University Field House complex. AEDs have also been placed in off-site buildings such as the Browne Center, an outdoor educational facility, and the University Police Department. The decision to place the units came as a combined effort between the Fire Department and UNH Administration. The areas that have the greatest occupancy, along with the availability of full-time staff was assessed before any unit was ordered. Initial education will be undertaken by the Fire Department. Record keeping, upkeep and maintenance will be handled by the Fire Department. The University of New Hampshire should be commended for their proactive fight against cardiac arrest.